A colorful display of potted flowers are on exhibit at the Cours Saleya market in the Old Town Nice in Provence, France in Europe. As you wander through the Cours Saleya Market in the Old Town Nice in Provence, France, many different stalls exhibit an assortment of items but none are as colorful and beautiful as these flowers. 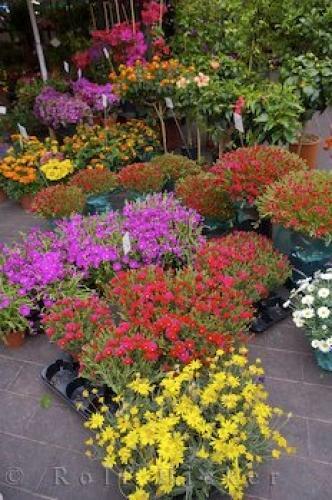 This display of potted plants are in full blossom with an array of colors that lights up the market stall and lures people towards this area. These potted flowers are ready to be taken home and transplanted straight into the garden and many of them will blossom again with stunning flowers the following year. If you are not a true gardener, display these potted flowers on your steps, doorways or in planters to add that extra color to the exterior of your home. Cours Saleya Market in Old Town Nice in Provence. ... be a little more finicky than others as they may require the proper soil, lighting and watering procedures while others are extremely simple and do not require that much tender loving care. The Cours Saleya Market in Old Town Nice in Provence is open to the public on Tuesdays, Thursdays and Fridays with fresh flowers always being brought in. There are many other items to be seen at the Cours Saleya Market including fresh vegetables, fruits and meats that are freshly grown in the outer areas of Nice, France. This is one market that should not be missed while visiting the Old Town Nice in Provence but prepared to spend a fair amount of time here as there is so much to see and do at the Cours Saleya. Potted flowers at the markets, Cours Saleya in Old Town Nice, Provence, Cote d'Azur, France, Europe. I photographed this photo with the digital SLR camera model Canon EOS-1Ds Mark II, aperture of f/5.0, exposure time of 1/125 sec. on ISO 100, as always I used a original Canon Lens, the focus lenght for this picture was 24mm.